Red Thermocap Radiator Cap 16 Psi 93-up Dodge,Chrysler,Jeep Red Thermocap Radiator Cap 16 Psi 93-up Dodge, Red Thermocap Radiator Cap 16 Psi 93-up Chrysler, Red Thermocap Radiator Cap 16 Psi 93-up Jeep, Mr. Gasket 2471R Radiator Cap, Dodge Challenger Red Radiator Cap, Dodge Charger Red Radiator Cap, Chrysler 300 [Mr. Gasket 2471R Radiator Cap] - $38.99 : 3rd Strike Performance, Your Source for Late Model MOPAR Performance Parts and Accessories! 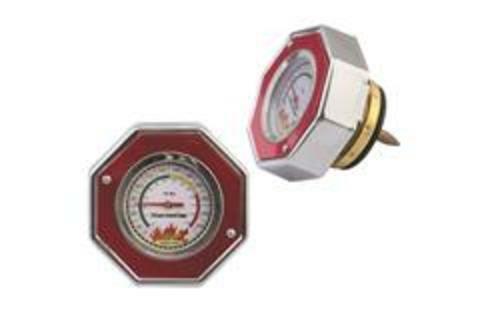 These Mr. Gasket Thermocap radiator caps combine a high-pressure radiator cap with a thermometer element; just check the integrated temperature gauge, and you will know when it is safe to remove the cap. They are manufactured from aluminum and are available in your choice of red, blue, or silver anodized finishes. The Mr. Gasket Thermocap radiator caps read temperature in both Fahrenheit and Celsius to suit any vehicle's needs. No tools or modifications are required; just remove your old stock cap and replace it with one of the new Thermocaps. No more guessing games about whether or not it is safe to remove the radiator cap--with one of these Mr. Gasket Thermocap radiator caps, you will be safe each and every time.